Amnesty International and the Bradley (now Chelsea) Manning Support Network initiated a petition on WhiteHouse.gov calling on Barack Obama to “grant clemency to Pvt. Bradley Manning.” The petition requires 100,000 signatures by September 20 for the White House to have to comment on it, or it will die. So far there are just over 24,000 signers. We are almost 25% of the way to 100,000 signers, and must pick up momentum quickly. 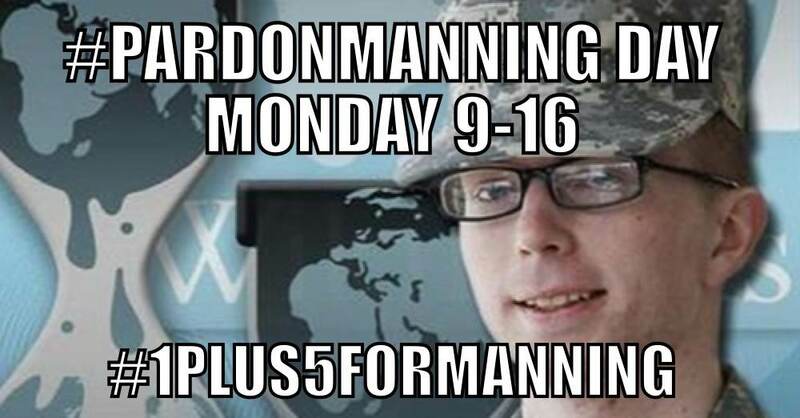 On Monday September 16, #PardonManning Day, will you sign the peititon, and do the work to be sure that 5 of your friends, family, or colleagues do so? You KNOW how to reach your people. Let’s come together by Monday with a mass outpouring for Chelsea Manning’s freedom. We’ve gotten some response that supporters of Manning don’t with to give the White House their email addresses. We are all for privacy rights. But have you read the news since June 5? The NSA via direction by the Obama administration already has so much more than your email address. Defense of Manning and Edward Snowden is exactly what’s called for in response to the government’s vast surveillance against whole populations. Debra Sweet is the director of World Can't Wait and blogs at debra.worldcantwait.net. We welcome and encourage discussion and debate. We find truth via contention.